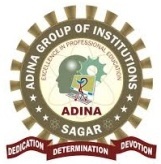 Shri Premchand Jain Memorial Society for Education is going to establish Adina College of Pharmacy from the academic session 2019- 20 with 100 intake. This institute will impart four years B.Pharm. course. Society is seeking approval from AICTE, New Delhi, Pharmacy Council of India. We have received NOC from Directorate Technical Education MP, Rajeev Gandhi Technical University Bhopal for affiliation of course and all other relevant bodies.